← THE WIKILEAKS TAPES – OUT NOW! 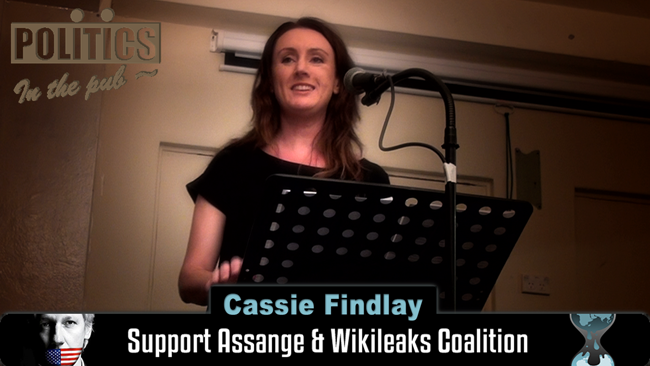 Sydney archivist Cassie Findlay talks about the global attacks on Julian Assange, Bradley Manning and Wikileaks at “Politics in the Pub”, September 21, 2012. This entry was posted in LIVING PROOF, NEWS and tagged Bradley Manning, Cassie Findlay, Julian Assange, Politics in the Pub, Wikileaks. Bookmark the permalink. Terrific speech Cassie Findlay. Succinct and to the point, raising some very valid questions on the miserable state of global journalism. It’s high time that Julian Assange and Wikileaks be given the respect they deserve as journalists that provide a very valuable service to those citizens that see the true value of keeping an eye on their government, or puppet governments of the great powers like the USA.